Marissa Farrar: FREE! 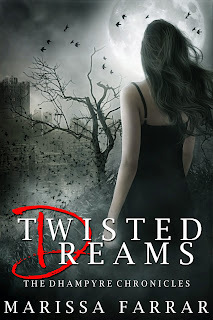 Twisted Dreams! My new adult, paranormal novel is free on Amazon for the next couple of days (17th - 19th May), so grab it while you can. The book is a spin off of my Serenity series, featuring a certain girl from the book, all grown up and off to college! Born of a vampire father to a human mother, Elizabeth Bandores' life was never going to be normal, so she can't imagine why she thinks starting college will be any different. Having grown up in the affluent Hollywood Hills of Los Angeles and desperate to escape, she decides on the small college town of Sage Springs. With dreams of being a writer, she joins the college newspaper and is introduced to blond, confident Flynn Matthews, Sage Springs' rising swim star. But a carnival has set up in the small town, and the boy running the Waltzer catches her eye. Dark-haired, leather-jacketed Riley is rude, with an air of danger. Elizabeth can't help but notice him. And when an accident thrusts them together, she discovers he's noticed her, too. I yanked myself out of his grip, tears blurring my vision. It was happening again, the thing I’d tried so hard to deny to myself. The person people saw on the outside wasn’t the same as the person who lurked within the slightly scruffy, try-too-hard exterior. I had darkness inside me. Writhing, coiling, scary darkness. I had been fighting it my whole life, but recently the darkness felt so much closer to the surface. My jaw ached, my throat running so dry I could barely swallow. No, no, no, no. I closed my eyes, trying to focus in on my reaction, trying to will it away. I wanted to tell the boy standing in front of me to run, to get away, but the words wouldn’t come out of my mouth. Movement and a yell, not one caused by me, made my eyes ping open, the driving darkness at my soul retreating at the distraction. Flynn stood between me and the new guy, his broad shoulders completely blocking my view of the dark hair and brooding eyes. I moved around the side in time to see the dark haired boy start to push up the sleeves of his leather jacket. “Exactly. This is none of your business,” the carny guy said, picking up on my words. I could see him repressing a smirk, which only served to make me angrier. The aching in my jaw increased, my throat tightening. Both men were watching me, Flynn with a confused, hurt expression on his face, the carny guy with an amused smirk. I didn’t even know his name, I realized. I don’t want to know his name, I tried to convince myself. But I did. Even with an annoying smirk that I wanted to slap off his striking face, I longed to know his name with every fiber of my soul. But right now, the darkness was creeping over me. I was seeing red, literally. The veins on both of the men’s throats, the spreading network across their inner wrists, all shone like a beacon to me. Threads of glowing red rivers of blood. “Just leave me alone!” I finished, needing to get away from them both. I turned and started to run, leaving the sounds and smells of the carnival behind me. You can download Twisted Dreams for free from Amazon!